Stencil Girl just released a line of stencils designed by Jessica Sporn. Jessica asked me and a bunch of other artists to take her stencils on a "test drive." The stencil hop began in December and will continue through June 2013. 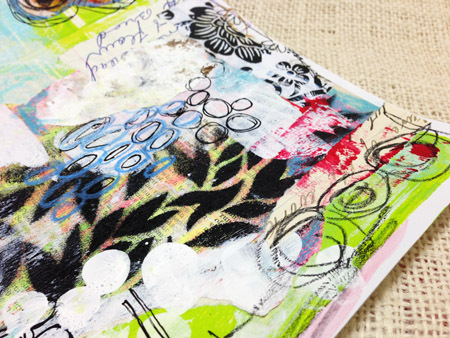 We'll show you how we used her stencils, and you're invited to play along too. I played with the Cascading Leaves Stencil. Visit Jessica's blog HERE for all the details! 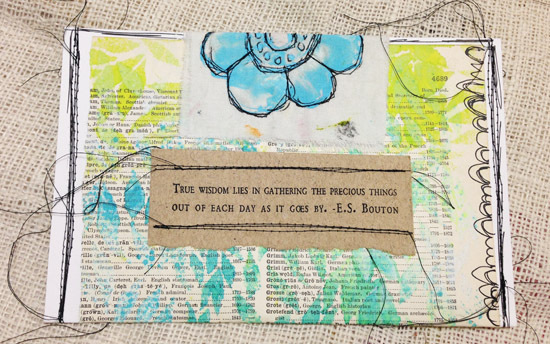 Art Journal Page: I used black spray paint with the Cascading Leaves stencil on the background of this journal page. I also used acrylic paints, oil pastels, collage papers, a black pen and the X Marks rubber stamp from my Mixed Media Essentials line. Stitched Pouch: I sprayed lime green and teal spray ink through the Cascading Leaves stencil onto a piece of book paper to create the base of the paper pouch. I also used acrylic paints, a piece of card stock, cotton muslin, sewing machine with black thread, quote, a black pen and the Bold Flower rubber stamp from my Mixed Media Essentials line. Mail Art: After I sprayed the lime green and teal ink through the stencil on the paper for the pouch, I pressed the stencil onto an envelope to get a reverse image. I also used collage papers and a black pen. Hop on over to these blogs for more inspiration!